If you love Florence, chances are you also love the food. I mean, I can’t think of better moments than devouring something delicious like a truffle panini at Procacci with a glass of prosecco along tragically fashionable Via Tornabuoni or sitting elbow to elbow at a bustling trattoria, wolfing down ribollita, bistecca and chianti immersed in old world soul. This city, with all its imperfections, really leaves an impression on every single person who visits. And if it doesn’t, that person isn’t awake to little joys of life. You live here (like me) because you love the lifestyle. Part of that romanticism comes from the food. As soon as her cookbook Florentine came out, I made sure to make it a point to buy myself a copy. It is the cookbook I’ve used the most this year. This book is a must have for several reasons. Emiko apart from being one of the most earnest mother/wife/food writers I know, has a special gift for recounting historical anecdotes. She does a ton of research including scavenging the county for ancient cookbooks and translating them, she actually took the time to read and dissect Artusi’s institutional cookbook La scienza in cucina e l’arte di mangiar bene (“The Science of Cooking and the Art of Eating Well”). 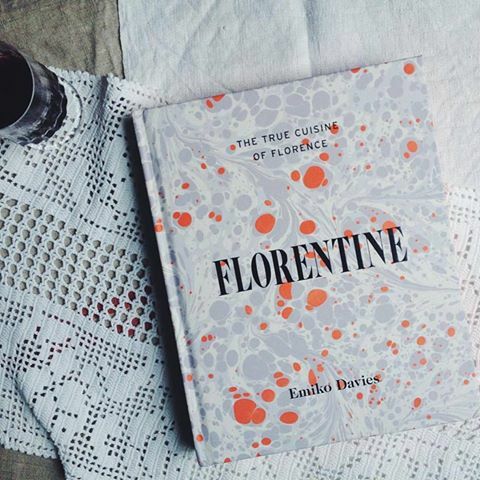 Not to mention, her mesmerizing photography skills which have captured Florence at its best, making anyone who consumes these pages, even those of us who live here, longing for a stroll down the characteristic Florentine alleys to hunt for casareccia home cooking. I was not sent this book to review, I insisted on buying the book at the Paperback Exchange in Florence, you know a bookshop (those places where you can go, see and flip through books in the flesh). Not to seem high and mighty, but rather to make clear that my glowing review is 100% on my terms. I really believe and support this fantastically talented woman and I want everyone who reads this post to get that book, hopefully to have a piece of Emiko’s magic and Florence’s food legacy at their home. Plus the photos of her charming daughter are beyond adorable! My re-creation of Emiko’s Piselli alla Fiorentina. Photo by Georgette Jupe (aka Girl in Florence) who was also apart of this diabolical surprise lunch! One of the most tasty recipes I made so far, was her Piselli alla Fiorentina (Florentine Peas). In making this dish, which was apart of a secret surprise lunch organized by one of her best (not to mention awesome) pals in which we all made a dish from her book, I developed a few new appreciations. The biggest one was the seasonality and importance of fresh peas. When I went to the market to get them, only one stand had them as it was very early in the season. Because it was somewhat still soon, the peas inside the pods were small and not as plentiful. I spent a lot of time shucking them and thus again, appreciated how important it is to not purchase processed foods. Since the amount I got wasn’t enough for the recipe, I had to use a small jar of pre-cooked peas. I could of course taste the difference and I’ll never be able to look at peas the same. My biggest suggestion is to only use fresh shucked peas for this dish. And the beauty is her recipes are brilliantly easy to follow. I also developed a higher appreciation for cookbook writers- they have to test every single recipe, you know! That’s not easy to make sure that anyone who picks up the book, can recreate the dish step by step. Also in this Piselli recipe, don’t underestimate the value of the broth. I tend to like high flavor, dry(er) dishes (thinking that too much liquid could dilute flavors) but for this dish- that was not the case. The broth flavored from the pancetta and parsley would be heavenly for any bread to mop up. Also, don’t underestimate that last bit of sugar at the end. 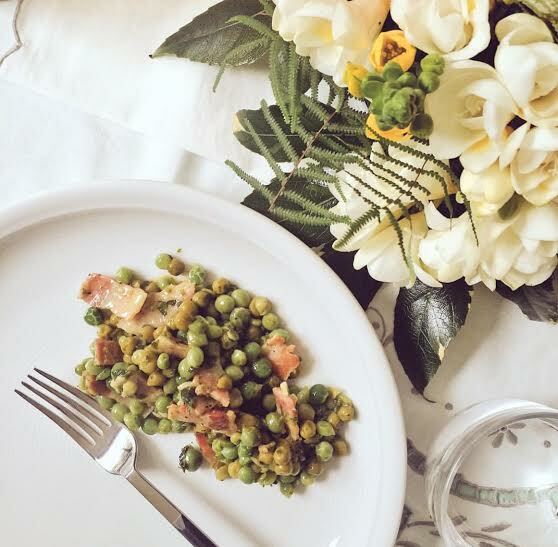 The pairing of peas and ham is always a good one but the secret ingredient of one of Florence’s best-loved contorni (side dishes) is a teaspoon of sugar added towards the end. You can choose to leave it out, especially if using sweet, fresh peas, but it adds a certain characteristic sweetness to the dish. The generous addition of water is intentional; the broth that results from cooking the peas is partly what makes this dish so beloved. 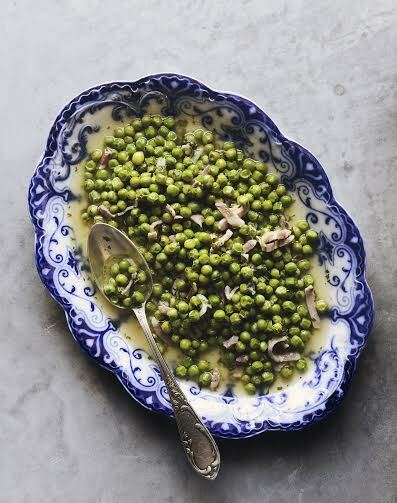 As Florentine painter-chef Guido Peyron wrote in his recipe book of 1956, ‘La grazia dei piselli alla fiorentina è proprio di essere serviti con abbondante aquetta saporosa,’ which means something along the lines of: the saving grace of Florentine-style peas is the fact that it is served with abundant flavourful broth. Like many Florentine dishes, this is even better reheated the next day. NOTE: In Florence you can find baskets of freshly shelled peas at the market, which saves a lot of time. You can also cook this recipe with good-quality frozen peas with great results. PLEASE NOTE: This is an edited extract from Florentine by Emiko Davies published by Hardie Grant $AU49.99 available in stores nationally. You can buy her book also online via Amazon. Hey there! 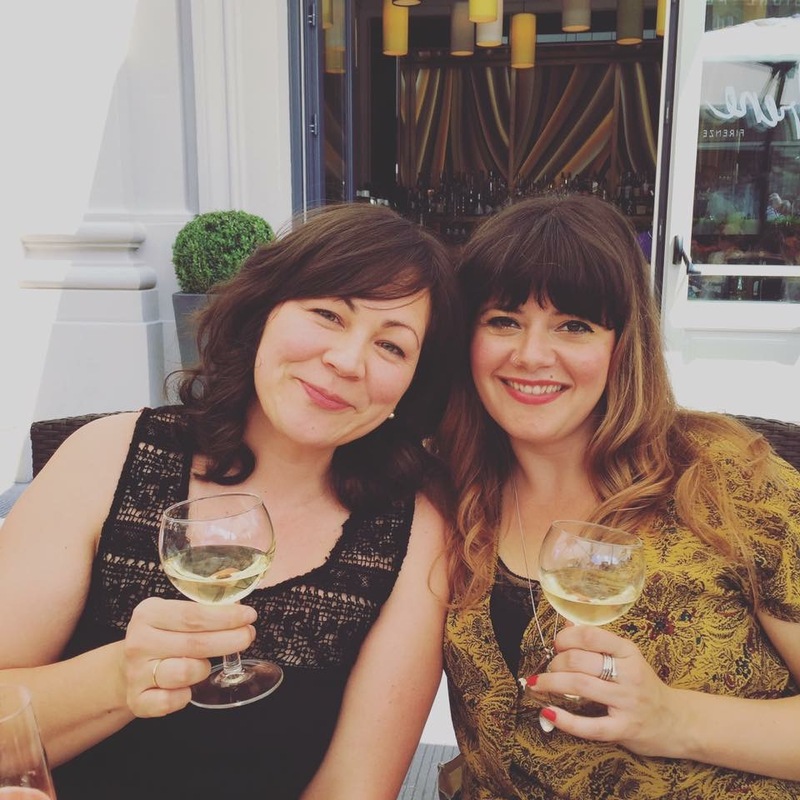 Want to stay in touch with more from Curious Appetite? You can subscribe to this blog. Follow along on facebook for more tips and words on Italian cuisine!